I have never made this and any been left over, people love it! This recipe is a general guideline on how to make it but you can switch around the proportions to your liking, or make more, its very easy and quick! Preparation: This only takes about 15 minutes to make! Get a decent sized sauce pan and heat up a quarter of a stick of butter. When the butter and pan are heated some dump in the cream cheese. It will be hard to mix until it has heated up some. Heat the cream cheese over medium-high heat until it is all melted and blended with the butter, you will have to mixed the cream cheese a lot to get it to a smooth consistency. Pour the cream cheese into your oven safe pan, then pour your refried beans into the pan that the cream cheese was just in. Heat the beans for a little bit. You don't have to wash the pan or anything between uses because it is all going to be mixed together anyway, but you may want to add butter or spray the pan to keep the beans from sticking. Mix in the taco seasoning and hot sauce to your liking. You might not need to use the entire bag of seasoning depending on how much you are making and how strong you want it. I usually use tapatio for the hot sauce but you are free to use whatever kind you like. I only use this because that is usually what is laying around lol. Turn off the heat and add the beans to your oven pan with cream cheese. Mix the bean and cream cheese together but not completely. There should still be pockets of cream cheese. I like a lot of cream cheese but it is really up to you. 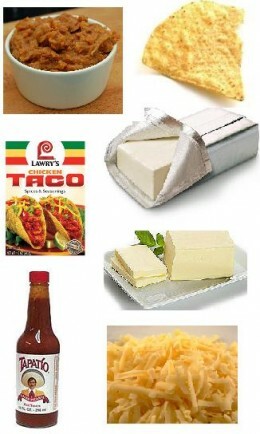 Cover the top of the bean dip with shredded cheese and bake until the cheese is melted on the top. Take it out and let it cool a little bit. Eat the dip warm though it is the best this way. If you are taking this somewhere like a pot luck or party I would make a lot because it always looks like more then it is and it goes quick! Even if it doesn't stay hot it is good cold, and it can easily be reheated! 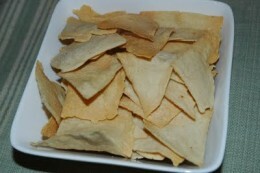 Cut tortillas into four pieces each. Then brush the front and back of each with oil and salt and bake for about 7 minutes. Check it frequently though so you don't over cook them, they will get harder as they cool. You can also deep fry your chips in oil, that is a little more difficult but really good. To test to see if the oil is hot enough dip the side of a tortilla in it to see if it bubbles if it does then its ready. Also make sure to salt your chips right when they come out of the fryer so the salt sticks. I also like to make my taco shells this way. You just put the entire taco shell in the oil and use tongs to fold it in the shape of a taco shell while it is frying. Hey any suggestions on a recipe you really want or if you need help with your recipe let me know. I can make anything you want and make sure it is the best and even to your preferences!